Toyohara Kunichika (1835-1900) Thirty-six Good and Evil Beauties: Kesa Gozen, 1876. Oban. 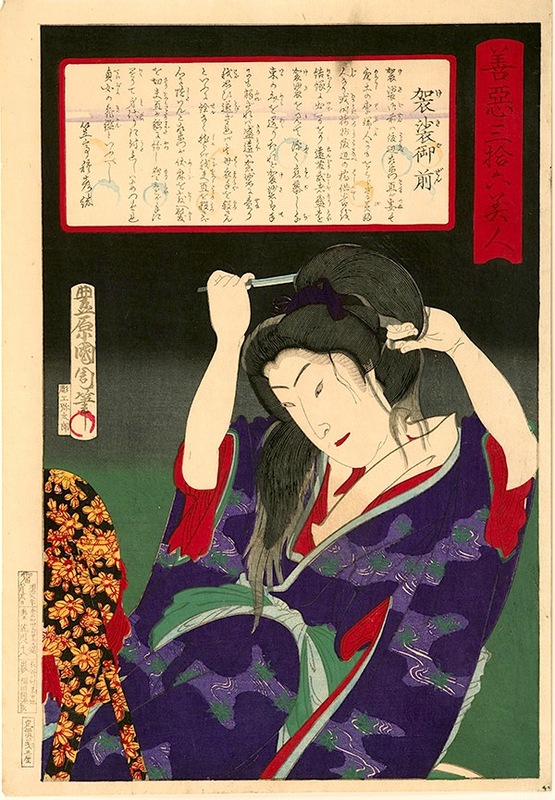 36 Good and Evil Beauties is one of the finest series of prints produced by Kunichika. The thirty six designs for this series are especially rich and the early editions are beautifully printed. Each print draws on a female character from history who has shown exceptional bravery or prowess, hence there are portraits of strong women, brave women, bandit women, heroines and loyal wives or powerful courtesans - a far cry from the passive and decorative bijin of the previous century. This is exciting stuff, the women are portrayed in great fluid designs... bold, ambitious, fearless. This print illustrates the beautiful Kesa Gozen. Endo Morito, the son of a minor courtier became infatuated with her despite the fact that she was married to a palace guard. He bullied her until she agreed to his advances on the condition that he murder her husband. She concealed herself in her husband’s room having first cut off her long hair. Morito stole into the room and cut off the head of the sleeping figure only discovering later that he had killed the object of his desire. He became a monk and famously spent three years doing penance beneath the freezing Nachi waterfall, the subject of many ukiyo prints. Here we see Gozen with a knife in her hand preparing to cut off her own hair in front of a table mirror wrapped in cloth. This print is magnificent; it is full sheet size and displays Kunichika’s address and family name on the left hand margin. Very fine colour, condition and impression. Signed Toyohara Kunichika hitsu with Toshidama seal. published by Morimoto Janzaburo.